When the international golfing elite gather outside the gates of Cologne for the BMW International Open from June 24 to 29, LANXESS will be part of the game. Pigments from the specialty chemicals company ensure that the professional golfers encounter not only flawless, but also optically perfect greens on the 72-hectare course at Gut Lärchenhof. Head Greenkeeper Christoph Vogel requested a green pigment mixture specifically to color the almost white silica sand he uses to regularly sand the course. “We want the golfers to get an impression of a perfect green during a tournament, so we are using colored sand for the first time, which does not leave behind any light-colored stripes on the grass surface,” Vogel says. Richard Baethke, applications developer in the Inorganic Pigments business unit at LANXESS, explains: “Because it was a special application, we first provided a sample. It was a mixture of the organic phthalo blue pigment Levanyl Blue G-LF and the inorganic iron oxide pigment Bayferrox 910.” After the greenkeeper approved the results of the tests, about 150 kilograms of the special mixture were prepared at the LANXESS site in Branston, United Kingdom, and then delivered to Pulheim, Germany. For nearly a quarter century now, auto maker BMW has been hosting this competition, which for some years has been the only European tour event held on German soil. It is time again in 2014 for Gut Lärchenhof in Pulheim-Stommeln to be the venue for the event. The course is one of the most attractive and interesting of its kind in Germany. The Stadium Course was designed by Jack Nicklaus, the most successful golfer of all time and a highly sought-after golf course architect. Each hole was modeled individually and all the fairways along the hilly landscape were designed to be visible. The greens were built to USGA standards (United States Golf Association) and meet the highest European requirements. Nine months before the golf pros come to play their championship games, Vogel and his team begin their elaborate grooming work. The fairway, meaning the area between the tee box and the putting green that is cut short, is mowed every other day, but only in dry weather. “The blades of grass remain vertical in the process,” Vogel explains, “because we want a dense top layer of turf to develop. That's important for things like the right hardness of the underlying surface.” The cutting height depends to a great extent on surface unevenness, weather and water supply. Shortly before and during the tournament, the grass is cut more frequently: the fairways are cut two to three times a day, while the greens are even trimmed four times a day, down to an unimaginable 2.25 millimeter. Thanks to this precision, readings of 12 feet (366 cm) are achieved on the Stimpmeter, a device that measures the rolling distance of a golf ball on the putting green, which is only about 8 feet (244 cm) on “normal” greens/courses. 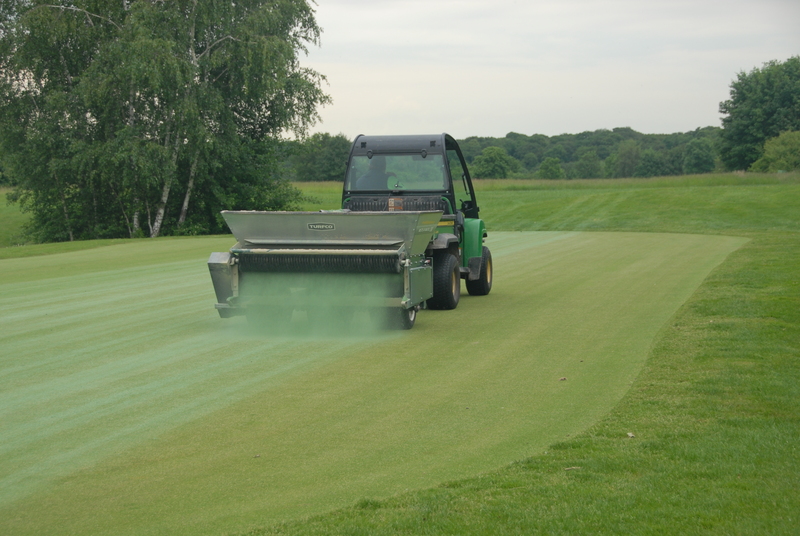 However, the list of tasks includes more than just mowing, aerifying, scarifying, fertilizing and watering (with some 50,000 cubic meters of water a year): the 1.5 hectares of greens are regularly sanded with silica sand having a particle size of 0.1-1 millimeter in order to ensure water and air permeability. This fine sanding also controls the hardness level professionals like. “If the turf and soil allow sufficient drainage, only a short thatch develops,” Vogel explains. 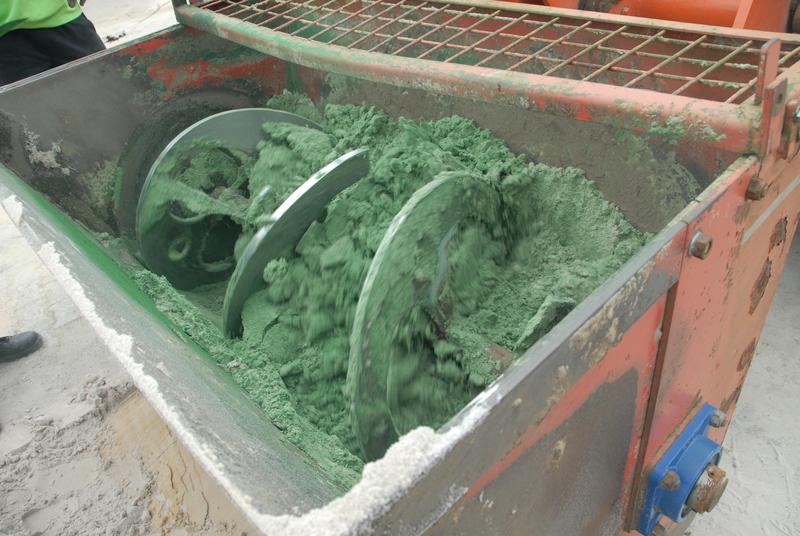 “That's why we additionally treat the aerified greens with the fine silica sand.” This year he added portions of the silica sand to the mixing bucket of a wheel loader together with the green pigment he ordered from LANXESS. “Normally a binder is required to make the pigment particles adhere to a substrate, but prominent English golf clubs have been coloring sand this way for years,” reports Simon Kentesber, Sales Manager Inorganic Pigments at LANXESS Ltd. in Branston, UK.